Links for The Rest Is Noise: Listening to the Twentieth Century (under construction). Richard and Christian Strauss, Richard Strauss's grandsons, maintain an elegant site devoted to the composer. Be sure to see the video of Strauss playing his late masterpiece Daphne at the piano (click on "Videos," then "Composer and Conductor"). Strauss died a few weeks after this film was made. The International Gustav Mahler Society has pictures showing the village inn and brandy distillery where Mahler was born, together with other places associated with his career. The Gasthof Föttinger in Steinbach, on the Attersee, maintains the small hut where Mahler wrote much of his Second Symphony and drafted his Third. In the summer of 2005 I visited Mahler's composing hut in Steinbach on the Attersee and described it on this blog. The Arnold Schoenberg Center in Vienna has one of the most amazing music sites in existence. An increasingly large percentage of Schoenberg's manuscripts and correspondence is open to all prying eyes. Includes Schoenberg WebRadio, which is sure to be gobbled up by Clear Channel. What did the riot look like? Some idea can be gained from Marcel L'Herbier's 1924 silent film thriller L'Inhumaine, one scene of which was filmed in the Théâtre des Champs-Élysées while George Antheil gave a recital of his modernistic piano pieces. An advance piece in Figaro announced that the concert would be filmed and that a riot was not only expected but desired. Quite a few people who had been present for the Rite scandal — among them Stravinsky, Diaghilev, Cocteau, and Satie — also attended this staged riot. Also in the all were Ezra Pound, James Joyce, Picasso, Darius Milhaud, Man Ray, Miró, Duchamp, Ford Madox Ford, Aaron Copland, the Prince of Monaco, and the Princesse de Polignac. You can view the scene on this page from American Public Media's American Mavericks radio series (scroll down). Nicholas Roerich, who co-created the scenario for the Rite and designed the sets for the original production, later went to America and had a most surprising career as a spiritual guru, some details of which are recounted here. There is a Roerich Museum on the Upper West Side of New York City. Stravinsky's prior breakthrough work was the ballet Petrushka. Here is an mp3 download of the "Shrovetide Fair" movement of Petrushka, available from IODA. Mariss Jansons conducts the Concertgebouw Orchestra. On the BBC website you can listen to an analysis of Béla Bartók's Second Quartet. More information can be found at the site of the Bartok Museum. This page devoted to Peer Southern's critical edition of Ives's Second Symphony shows how Ives transformed Stephen Foster's tune "Massa's in de Cold Ground" into the first theme of the symphony's opening movement. At the Library of Congress, sheet music for Will Marion Cook's "On Emancipation Day." Go here to listen to generous portions of tracks from Osmo Vänskä's authoritative recordings of the seven Sibelius symphonies on the BIS label. For example, listen to the glacial expository section of the first movement of the Fourth Symphony, and also to a good part of the finale of the Fifth, up through the first statement of the glorious "swan hymn" (p. 167 of The Rest Is Noise). There is also a page for Vänskä's recording of The Tempest, Sibelius's last major work. Not surprisingly, many Sibelius sites can be found in Finland; the Finnish Club of Helsinki has an especially informative site. There are extensive pages devoted to Sibelius's home, Ainola. At a page belonging to the photographer Pertti Jenytin you can see Stravinsky at Sibelius's grave. In an article in the Finnish Music Quarterly, Kari Kilpeläinen describes the fate the Eighth Symphony. One major regret of the book is that I was not able to spend more time on other twentieth composers of the "conservative" type. A personal favorite is Carl Nielsen. There is also the distinguished retinue of twentieth-century British composers that begins with Elgar and proceeds through Vaughan Williams, Bax, Holst, and Havergal Brian to the latter-day Romantic symphonist Robert Simpson. Among a host of post-Sibelian Scandinavian composers, some worth exploring are Eduard Tubin of Estonia, Karl-Birger Blomdahl and Ingvar Lidholm of Sweden, Aulis Sallinen and Einojuhani Rautavaara of Finland, and Geirr Tveitt and Harald Saeverud of Norway. In recent decades, the one-time avant-gardists of the "Ears Open" troupe in Finland have undergone a mellowing and broadening of their musical language, often making reference to Sibelius's once unfashionable legacy. Dedicated sites can be found for Esa-Pekka Salonen, Kaija Saariaho, and Magnus Lindberg; sound samples are available at all. The Kurt Weill Foundation publishes the Kurt Weill Newsletter. A Hanns Eisler site, with biography and audio samples. The Shostakovich Center in Paris. Video of the young Shostakovich playing his First Piano Concerto. The pages of the Prokofiev Society include back issues of the Three Oranges Journal. See also the Prokofiev Page. Informative site devoted to a reconstruction of Prokofiev's ballet Pas d'acier. There is a matching site for the unrealized Meyerhold collaboration Boris Godunov, with much remarkable documentation, including a photograph of Meyerhold speaking five days before his arrest. There are extensive selections from the papers of Aaron Copland at the website of the Library of Congress. 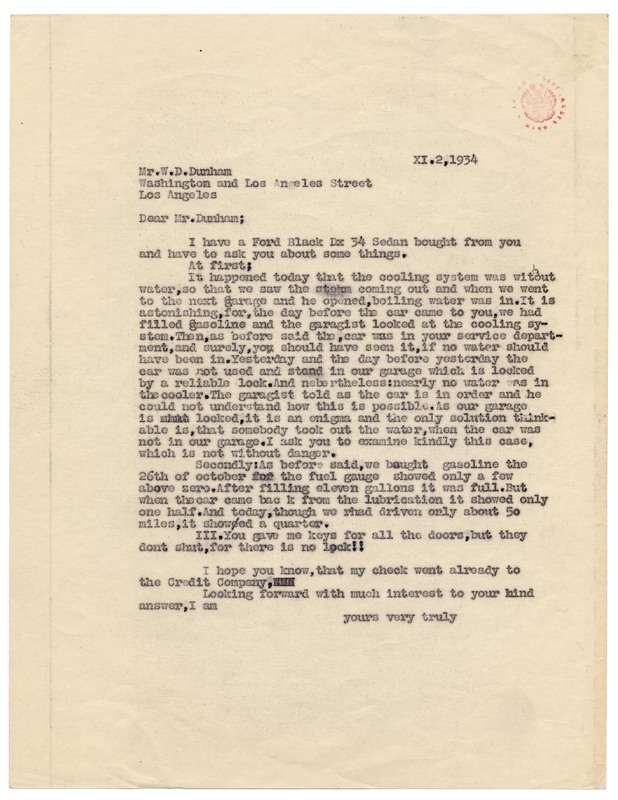 You can read here a letter that Copland wrote to Citkowitz in September 1934, describing his experiences delivering a Communistic speech to farmers in Minnesota. The site also has Copland's sketches for Appalachian Spring. Here you can see him beginning to work out the ballet's spacious opening, and here is the passage in the coda marked "like a prayer." There is a matching site for Leonard Bernstein. See also Copland House and the official Bernstein site. Andrea Olmstead's Roger Sessions site, with complete versions of her out-of-print Sessions books. At this University of Virginia site you can view the complete 1938 Resettlement Administration film The River, with music by Virgil Thomson. 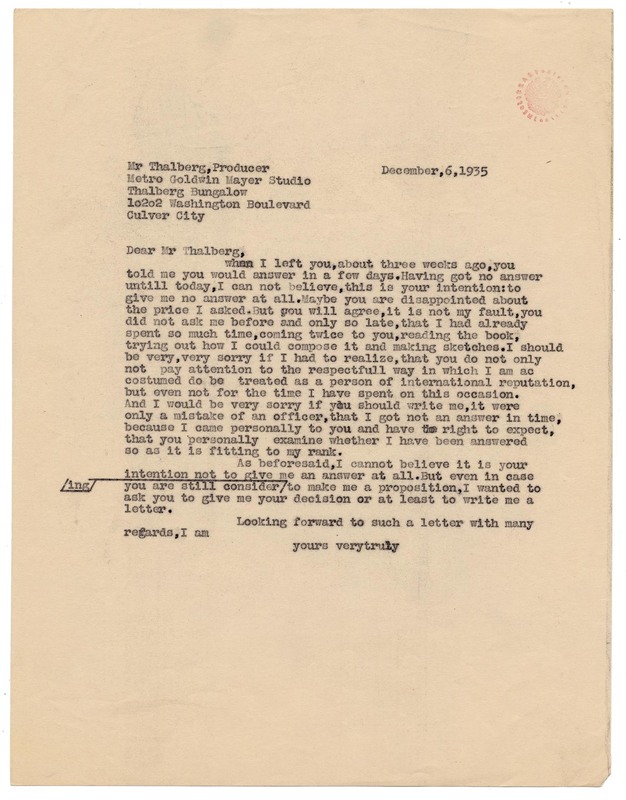 The Schoenberg Center has a digital scan of a letter that Schoenberg wrote to Irving Thalberg, head of production at the Metro-Goldwyn-Mayer studio, following up on a meeting at which the composer discussed with Thalberg the possibility of writing music for the film The Good Earth. Nothing came of the plan. There's also a charming letter in which Schoenberg quizzes a car mechanic about problems with the cooling system in his brand-new Ford sedan. The official site for Karlheinz Stockhausen contains more or less everything you need to know about the output of the leading postwar German avant-gardist, plus quite a bit more. For a guided tour of early electronic works, visit the German site Medien Art Netz. Here you can listen to Cage's 1939 piece Imaginary Landscape No. 1, which employs a record-player as a musical instrument; Stockhausen's pioneering Etude I, the first sine-tone composition; Cage's Williams Mix, composed of some six hundred tape fragments arranged according to the demands of I Ching; and Stockhausen's epoch-making Gesang der Jünglinge, probably the most formidable piece of the early electronic era. These pages at the website of Columbia University's music department has much more about the genesis and structure of Stockhausen's electronic masterwork. For a good collection of John Cage links. Also worth consulting are James Pritchett's writings on Cage. The complete transript of Copland's 1952 appearance before Joe McCarthy's Permanent Subcommittee on Investigations can be read at the Senate website (see S. Prt. 107-84, vol. 2, p. 1267). Chris Villars' comprehensive Morton Feldman pages. The University of Buffalo's Feldman archive. Courtesy of Other Minds, Cage and Feldman in conversation. The extensive site of the Britten Pears Foundation, based in the composer's former home in Aldeburgh, has a detailed chronology of Britten's career and background for many of his works. A BBC discussion of the Sea Interludes and Passacalgia from Peter Grimes. (Requires RealAudio.) The BBC 4 has several radio interviews with the composer. Boston University's Messiaen Project, anticipating the composer's centenary in 2008. György Ligeti page at Sikorski. An official Frank Martin site. La Monte Young's MELA Foundation. An analysis and performance of Adams's The Wound Dresser, courtesy of the BBC. A Galina Ustvolskaya site has a priceless picture of Ustvolskaya being applauded by Mstislav Rostropovich and Reinbert de Leeuw. Audio streams of American composers of many eras can be heard at Art of the States.